We love fall colors. We have been out on some hikes enjoying them here too. We are starting to get snow in the mountains already though so they won't be around for much longer. Fall is pretty here in TN too. Be careful on the end of the rocks! Enjoy. Wow! Look at those colors! It seems our part of town in New Mexico misses the changing of colors. So beautiful! Love the colors. Woofs to Bella! What a beautiful fall image! Pretty shot. I love the colorful leaves this time of year! I'm impressed you climbed up onto that rock, you must be very brave! What a lovely, peaceful, meditative photo:) Stunning colours. What a wonderful picture! Thanks fur visiting my blog. My face was asking "could we please go home now", we were in the audience at the Martha Stewart Show last year. i just gave your blog a quick skim and added it to my google reader. it looks highly enjoyable! can't wait to dive in. i have a design question for you if you don't mind--your tab with the blog roll... how did you do that? did you install a gadget on the page or did you do the whole thing manually? Whew - I spent so much time checking out the blog hop yesterday, I'm only just now getting back to my own site! We actually don't have much left in the way of leaves here either since "#snowtober" blasted through a couple of weeks ago. (That picture is very, very old. ;) But it is still 'officially' fall and I wanted to enjoy the colors a little longer. 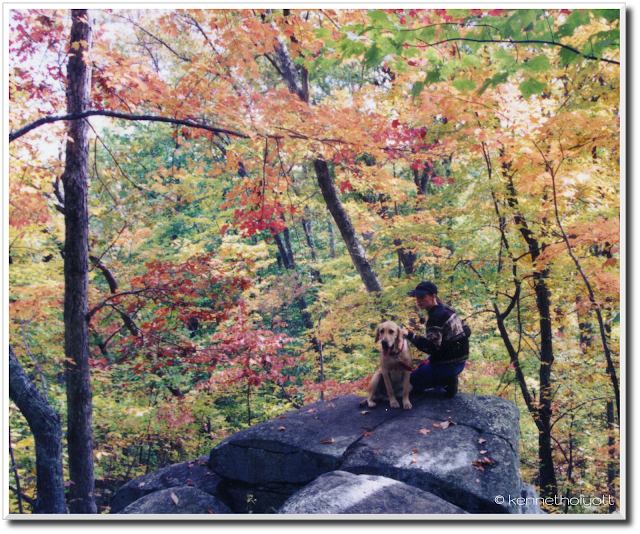 My Lab and I used to go hiking a lot and I love your blog for all the hiking you get to do. Thanks for visiting. Fall is my favorite season. Thanks for visiting! Hello Harville Hounds and mom! Thanks for visiting. I should probably add an 'about the pictures' page because my dad's photos seem to be the ones getting the most attention. ;) He had a wonderful eye. It is pretty up here this time of year, isn't it? Thank you and thanks for visiting. New Mexico, I understand though, has its own lovely colors that you get to enjoy all year long. I hope to visit someday because it looks so lovely. Thanks for visiting. Your blog is gorgeous and your photos phenomenal! I'm hoping to learn by watching. Hi Snoopy!! Thanks for stopping by and saying hi. I've been enjoying your blog. It's a favorite of mine. Brings me back to a time when I was in grad school, Beau was a young buck and my dad and I used to go for walks together in the Rhode Island woods. Hi there, Bailey! Thanks for visiting. How did a doggie get to be in the audience for a MS show, though? Is she just that awesomely dog friendly? That's kind of exciting. Hi Lauren - Wow, thanks for adding me to your reading list. I haven't been around long but I hope you find what's coming interesting enough. FTR, I'm a bit of a geek so typing up the html was no big deal. Setting it up was a bit time consuming but keeping up with it hasn't been too bad. Wish I had a better answer for you. LOL - you're too funny. And yeah, I didn't like having so much stuff in my sidebar either which is why I moved it to a page. :) Thanks. And thanks for visiting!